I'm starting to buy gear to bike camp this summer. Was wondering if anyone had recomendations on a good COMPACT 2 or 3 person tent. I'm hoping to hit Riders Roost and maybe T.W.O. a couple of times this summer. The sleeping gear is easy to choose from but it don't do no good if you're sleeping in water after a squall or condensation creates problems inside a tent. Also, does anyone here have Willie & Max saddlebags and tour trunks and would you recommend them to withstand wet weather conditions? Your site has two of the manufacturers on the list I've been making. I've pretty well narrowed my "standard" to a pack size of 19" length and 7" or less diameter or less. Price, and weight aren't that important to me. I tend to beleive (1) you get what you pay for, and (2) the bikes toting it, not me. I found a couple of sites myself with pack dimensions and reviews but these people seem to be more concerned with what they have to tote into the wild and how far they have to tote it. Most of these same people seem to want to camp under more extreme conditions than I would ever consider riding in. I'm most concerned with how to pack my bike conservatively and safely. I like you are based on the East coast. I figure my absolute coolest conditions to be around 40 degrees at night in the Smokies or mountanious Georgia. I also have to consider the humid climates of the local area where it rarely falls below 75 degrees in mid summer. You can see now why I'm concerned with condensation in the tent. I was kinda hoping to get a few recomendations of tents being used and the skinny of how good or bad their features were by bikers. This might help me look for something I had'nt originally considered important to me. To others that might follow looking for something simular, I'll throw out a couple of that I've found also. By the way Chessie, your site offers better prices overall on the models I was considering... thanks! I have been looking at the "Spotz Pac" (151-300 & 151-301) that J&P Cycles has, but I know nothing about it. Let me know tent you decide on because I hope to do some camping this summer also. will take a picture and send your way, not sure what they will fit. some wear on inside towards wheel or pipe, depending on which side you put it on. pm me an e-mail addy if interested. DILLIGAF, looks like a nice setup! Everything's together saves having to round up the seperate items for sure. Wish they had more info on the tent though... it looks like one of those bivey types that you can't sit up in and have to wiggle into your clothes and sleeping bag. 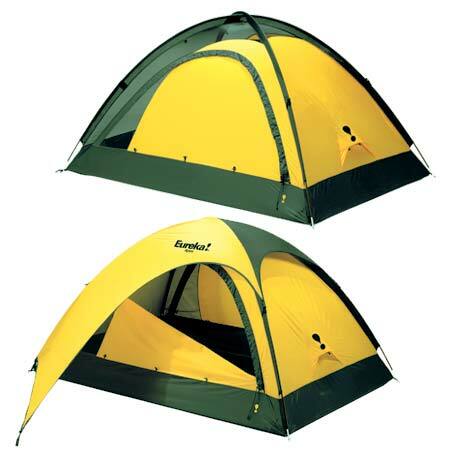 I've been looking real close at the Eureka Backcountry 2 and their Apex 2A tents. 6.5 diameter and 16 inches long is small enough to strap down on most any bike. Price is nice too compared to the competitions. Thanks Tom. It sounds like you have the standard type saddlebag from the description but I need the slanted style to fit around the shocks on my Superglide so I don't they'd work for me. Someone might see your post and PM ya about them though. Appreciate the offer though! I'm running W&M black magic throwovers. I've had them on the bike for over 3 years and have been through some serious downpours. Never a drop of water in the bags. I don't think you can beat them for the money. Take it from someone who has backpacked many a mile throught the Smokies and carried one on a bike. Eureka Timberline is the way to go. Large enough for two and better for one. Self-Sustaining and easy to set up and take down. No problems in the rain either. Hope that helps.